Students at Trinity have the opportunity to participate in a variety of clubs and extracurricular activities. These student organizations foster learning, complement Trinity's balanced curriculum, and offer students access to skills built outside their regular classrooms. For more information about student organizations at Trinity, email Peter Schnuda at pschnuda@tcsfairfax.org. Blue Crew is a club whose mission is to cultivate school spirit at Trinity. We strive to excite and promote unity amongst sports teams, students, and families. Students can play chess with their peers. It is not necessary to already know how to play chess; students will also be able to learn how to play! Color Guard honors the men and women who have served our country while honoring our nation's flag. The Color Guard wears military uniforms from various periods in American history for all presentations at school events. Student-athletes meet weekly to study and reflect on the Word of God and how all people— including athletes—are commanded to compete and do all things with excellence for the glory of God. "Gryphons Going Green" seeks to integrate ideas of education and service in order to educate the Trinity community on issues facing our environment, foster a love for the environment among Trinity students, and interact with the Lower School students to start them on a path of becoming good stewards of God's creation. Members of Latin 1, 2, and 3 meet together to discuss culture, literature, and arts from Latin history. Students in Grades 7 and 8 learn, apply, and master math concepts in a fun and engaging way together. Students in this club will learn and be inspired by speakers and topics in the field of medicine. The National Art Honor Society was established in 1978 for "the purpose of inspiring and recognizing those students who have shown an outstanding ability in art." Students are inducted into NAHS in the fall. The purpose of the National Honor Society is to recognize and promote scholarship, service, leadership, and character amongst high school students. Trinity’s chapter consists of juniors and seniors who have been selected to participate based on the four characteristics mentioned above. The TCS NHS is a great opportunity for like-minded students to work together for the benefit of the school and community. 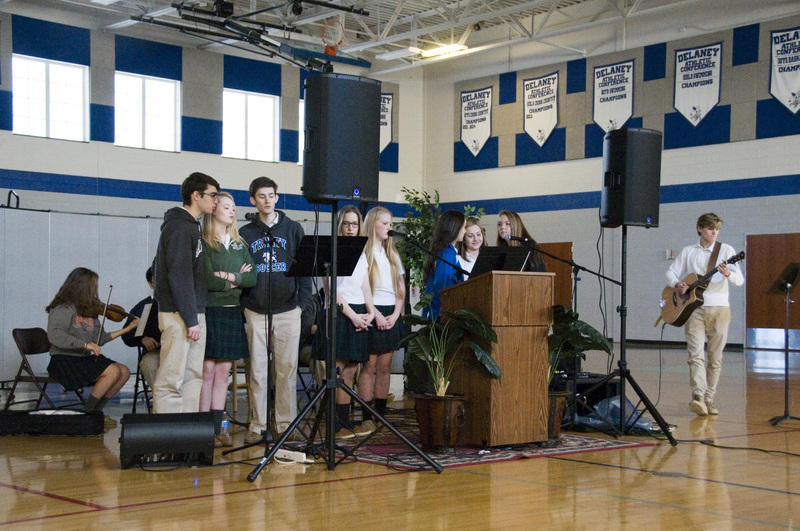 Students practice to lead their classmates and faculty to worship through singing and music during chapel services. Praise Team applications can be found on the portal. Seniors meet weekly to study and reflect on the Word of God. Students in Grades 7-8 meet weekly to study, reflect, and apply the Word of God. Members of Spanish 1, 2, 3, and AP Spanish meet together to celebrate Spanish culture. This team is designed to equip students with advanced public speaking/debate skills, valuable tools for young Christians looking to defend their faith in college and beyond. In addition, it can offer our Trinity students an opportunity to explore their talents through debates, speeches, and acting competitions against both public and private schools from the region. Students will learn, discuss, and share advances in science, technology, engineering, and math. This group seeks to further their understanding in these areas as well as the fields that apply these concepts. Students on the SEAL team pledge to strive to be reverent to God, respectful of others, and responsible for themselves, seeking to honor Christ in everything they say and do. The National Spanish Honor Society is an academic organization dedicated to promoting the study of the Spanish Language and the culture of Hispanic countries. Students are inducted in the fall. Spanish 5 club members will help seniors who have completed Spanish 4 maintain their Spanish knowledge, engage in conversational Spanish, and learn new concepts in Spanish. The Student Government of Trinity Christian School exists to glorify God by serving and representing the student body of Trinity. The SGA facilitates student involvement and service to our community. Students are elected by their peers. Students in Grades 7 – 11 meet weekly to study and reflect on the Word of God.